Welcome to the Woodland Manor, Koetje Builders latest offering in Railside West, just minutes away from the new Metro Health complex. This home has been designed to help bring the beauty of outdoors in. The sunken garden room with a metal and wood ceiling is located off the dining room and leads to an awesome backyard patio area. The Master Retreat is tucked away from the other bedrooms right off the spacious kitchen and has its own deluxe bathroom with a whirlpool tub and tile shower. In the daylight lower level you will find room to add 3 bedrooms, 2 baths, and a family room with a kitchenette and theater area. There is even room for a hidden storage area behind the theater room. 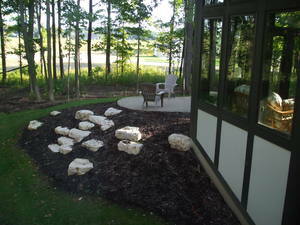 The Cottages at Unity Timbers by Koetje Builders offers quality construction and wonderful sites. Choose from three fully customizable floor plans or let us help you create your own. Wooded and walkout sites are available. Featured unit has custom built cabinets, lots of windows, optional sunroom, and a color accented cathedral ceiling which makes it easy to add a new splash of color. Call us or stop by to start designing your own dream Cottage at Unity Timbers. 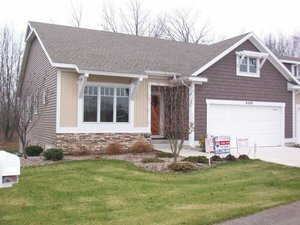 Welcome to the Waters Edge Bungalow, Koetje Builders' latest offering in Unity Timbers. Spacious views of Unity Pond greet you from the moment you walk in the front door and continue to be revealed throughout the rest of the home. The kitchen, dining room and family room are designed to be all one large room but each one still has its own defined space. The cathedral ceiling with soffit detail, plant ledges and rope lighting gives a custom designed feel. The Master Retreat is tucked away from the other bedrooms behind the garage right off the spacious family entrance hall. In the lower level you will find a large family room with built-in entertainment center, 2 additional garage stalls, and room to add 2 bedrooms and a bath. 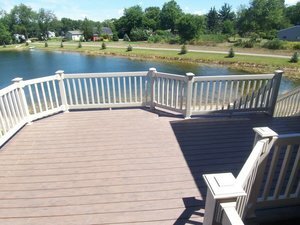 The deck has been designed to preserve the views and offer lots of space for outdoor fun.